This might be on wrong forum thread, sorry for that. My buddy Doug went through a sort of pathological liar phase in high school... making up stuff just to see if people would believe it. 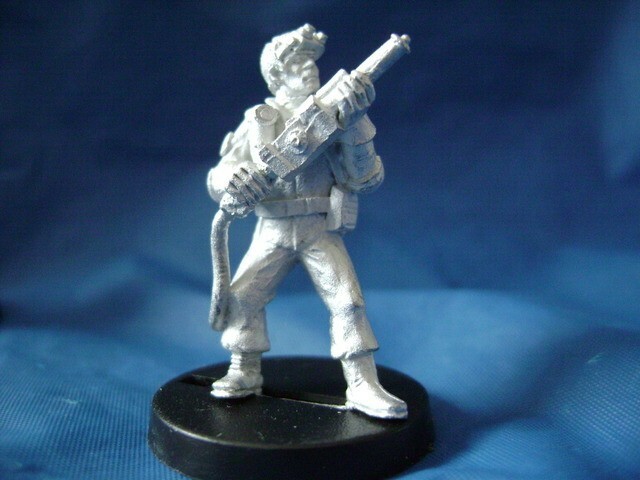 One of the ones he strung me along with was a claim he'd seen metal GB RPG minis in a catalogue. I could picture them in my mind, how awesome they would look. And now it looks as if it might actually happen! I got one!... 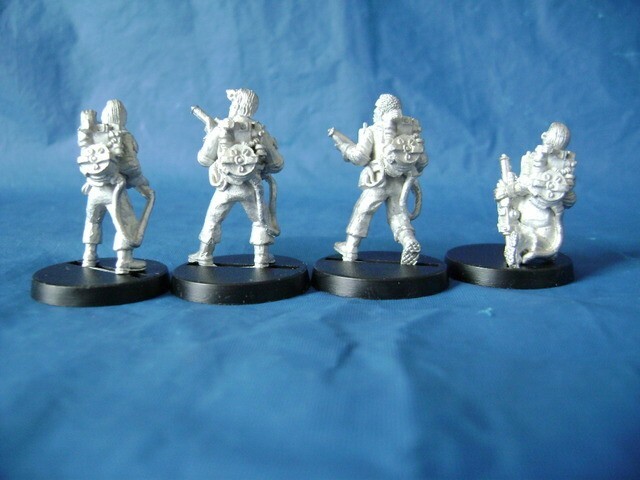 full set of Figures, that is. They showed up in the mail today. 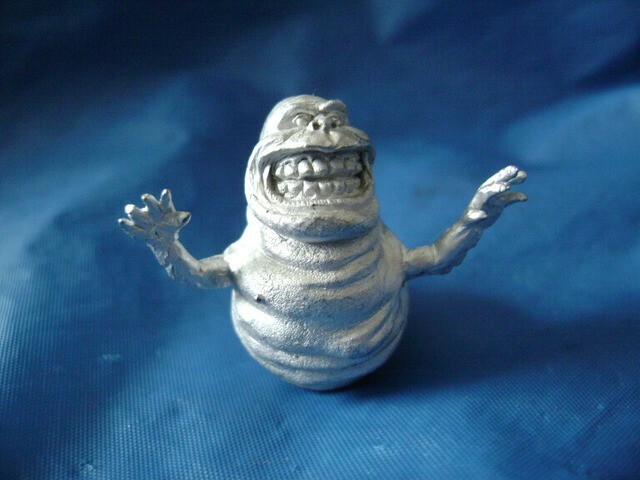 Being the start of the run, the castings are very crisp and extremely clean, hardly any excess flash to file off. 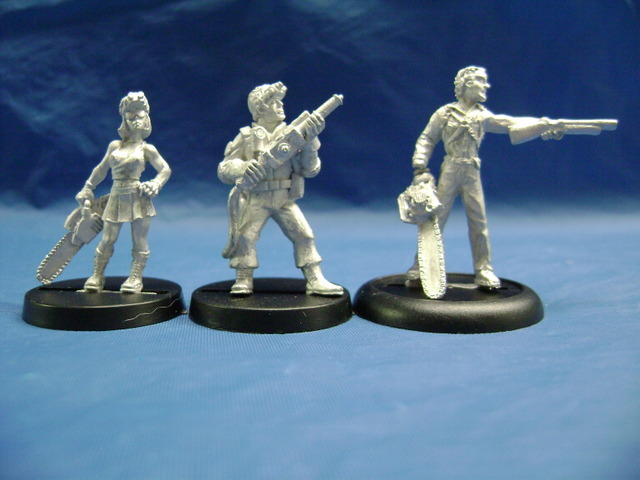 For being Unlicenced Paranormal Investigators, they look very good. 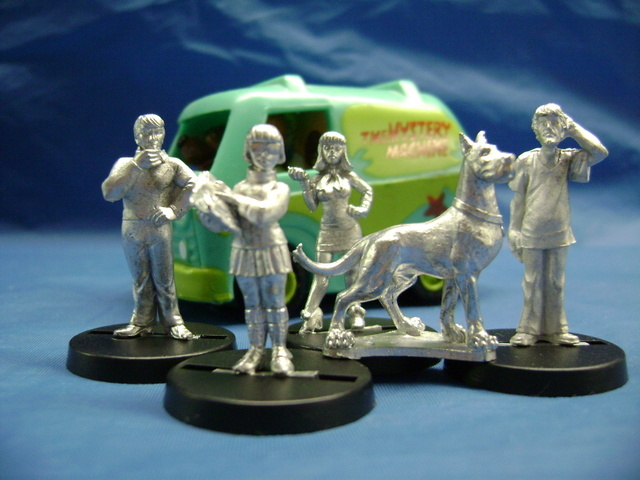 The Packs resemble the Kenner/Cartoon version. 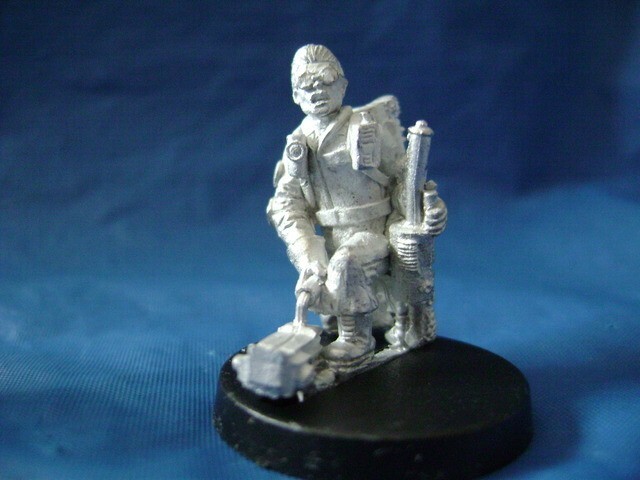 Here are some close-ups of the Figures..."Egon" ready with a Trap. "Winston" walking up to join the group...notice they all have Flashlights and Radios on their Pack Straps like in the Video Game. "Peter" waving to the Ghost to get it's attention. Chibigear mentioned the 1:43 scale Ectos as a good fit. 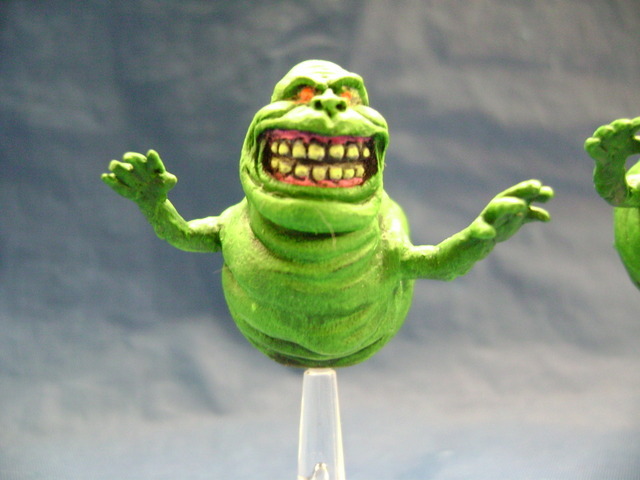 I happen to have the Hallmark Ecto Ornament which is roughly 1:43 scale and goes nicely with the Figure set. 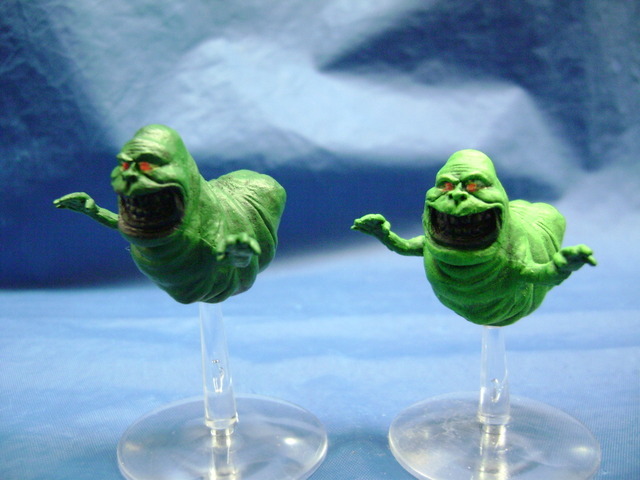 I didnt want one of those Ecto ornaments, but then I got my own set of Crooked Dice Paranormal Exterminator figurines and I see what an excellent scale the Ecto is with these, and I really want one now, but they are $50-100 awesome pics Capt, you captured every little detail with your camera! 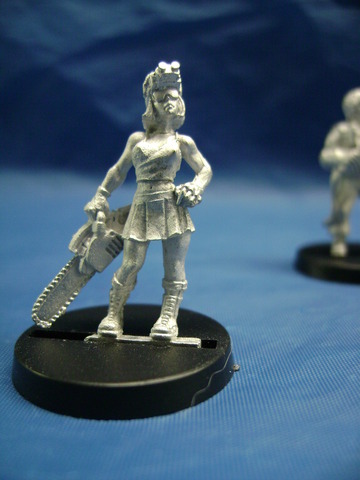 cant wait to see how you paint them! 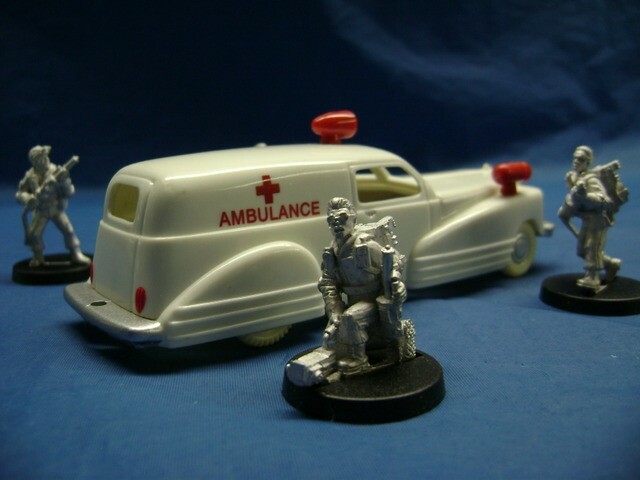 ...nothing at all like a MM, but it has a nice retro look, comes with Sirens and can be had for $14.00 or less. I took the Box Art and started to Ecto-fy it. With some junk on the roof, it should make a passable substitute. 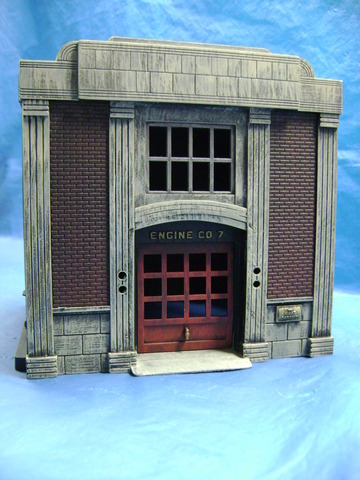 Being that the figures are in scale with most O Scale Model Railroad items, I looked for a Building with some GB Firehouse attributes. The most plentiful are the Plasticville line. 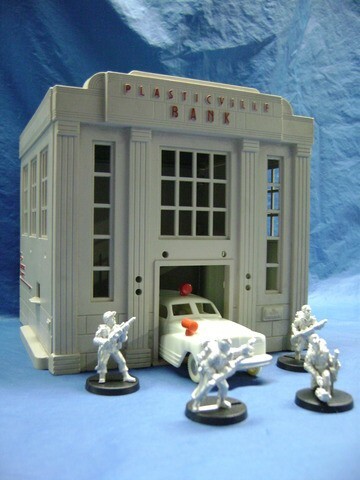 I chose the Bank, it has a nice Block bottom and no street level Windows. 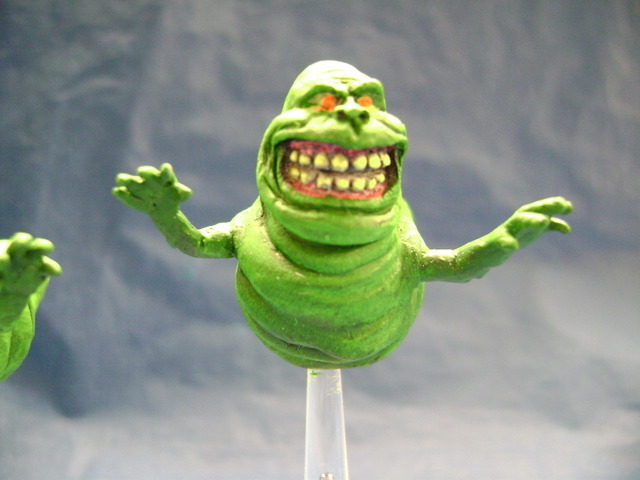 Being a "fixer upper", unlike the Ghostbusters, I bought it for only $12.00. The Door area needs to be widened so it can be "driven" through and I might cover up the side rows of Windows on the front, still undecided. The split second I ordered them, I hopped on Scribd and got the West End rpg and the 4 ed GURPS. very nice! 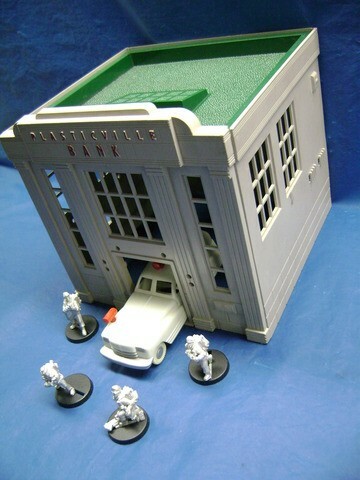 now Im wondering.... if you bought 2 of those banks, could they be stacked on top of one another ? Wow, a serious gamer! Nice, my interest is mostly with the Figures and display. 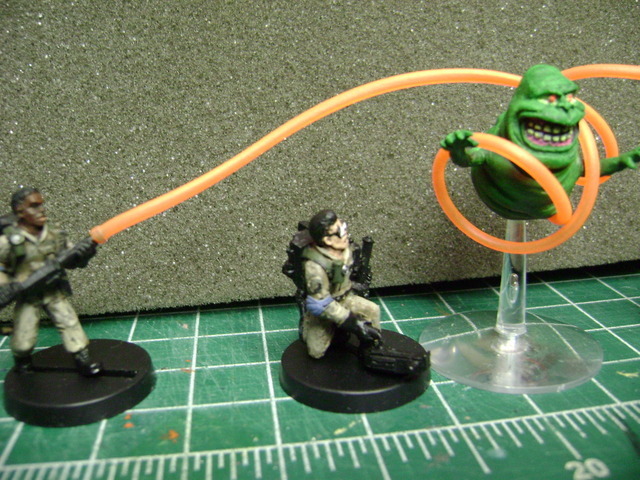 Did you hunt down a copy of "Ghostbusters International"? It would take quite a bit of slice and dice. The columns and trim at the top makes it difficult. yeah I saw that afterwards. how easily does this plastic cut ? it looks pretty thick on the sign part, so probably not feasible to slice it off. 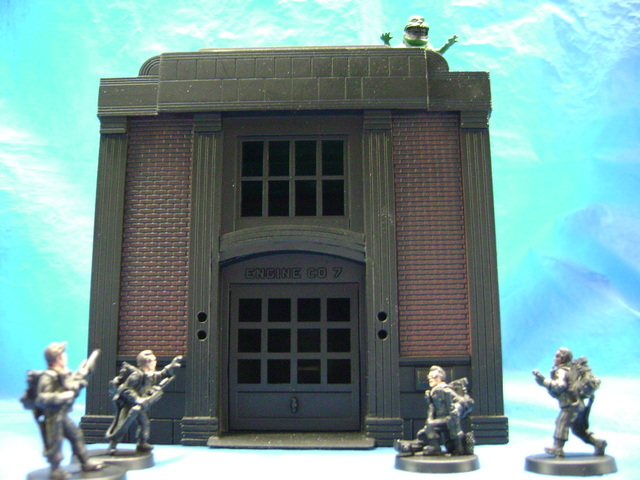 I could always use my firehouse box from my RGB cartoon set, or just design my own, like I did for the minimates. It's molded in "steps" so if you cut off that section you would have a gap to fill. I did this today. 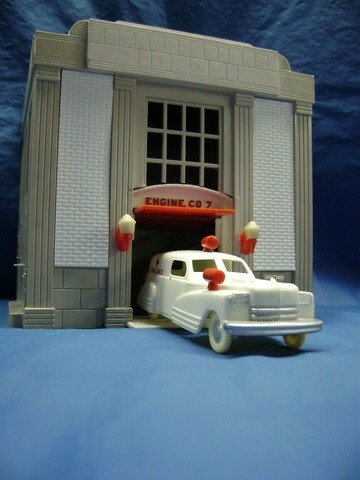 It looks a little more Ghostbustery..
...and the "Ecto" fits thru the front without scraping. The 'Bricks" are only taped in place to see how it looks. I plan to fill in the bottom row of window on the front. I got some different Figures from Hasslefree. 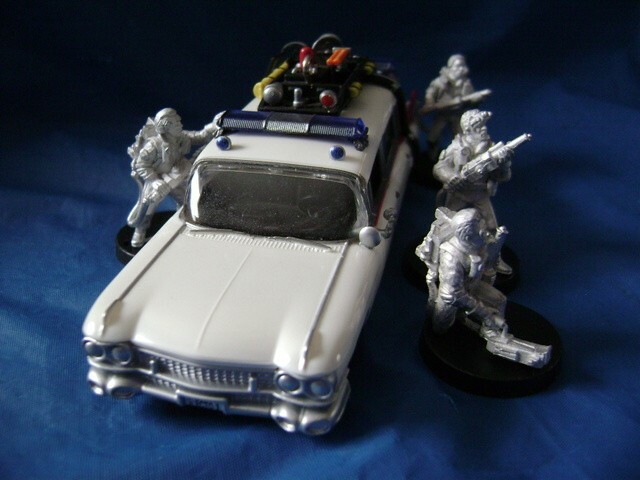 I didn't buy any of their Zombies but I got a few hero types to go with this other Vehicle I found. 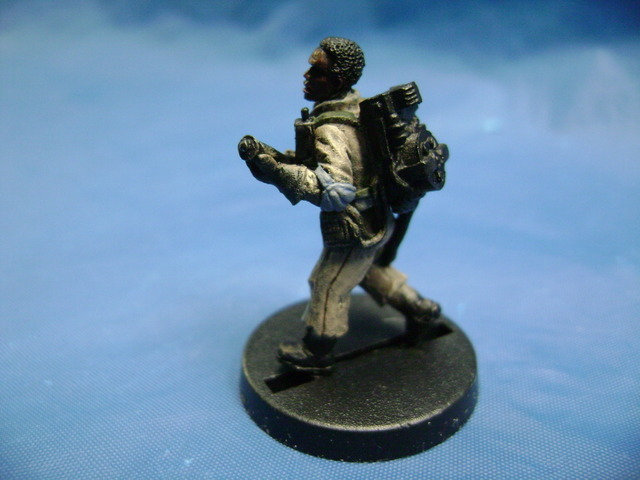 You should also see this guy on the linked page...there is another version of him named Oakley on the "Modern Adventurers" Page...different pose. 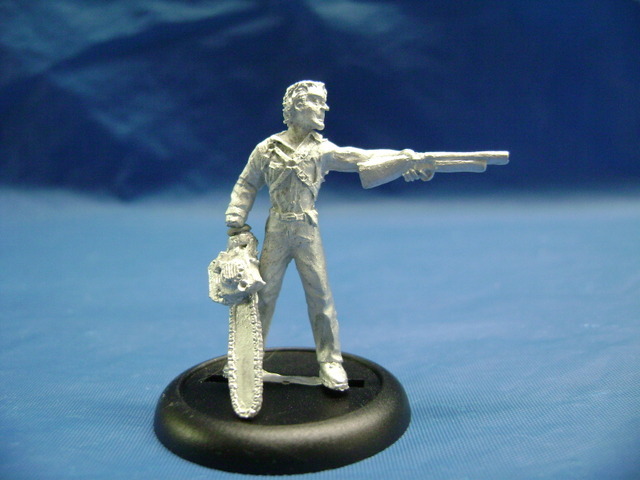 The Chainsaw is a separate piece so I just sticky tacked it there to take the pic, it needs to be Superglued in place. I figure you can never have enough "Hero" types. The real reason for this post? 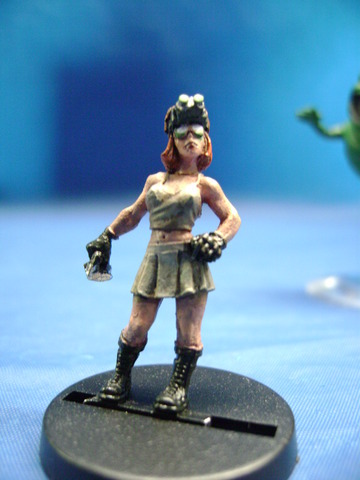 I also found this version of Velma, called "Louise", on the Adventurers page. . 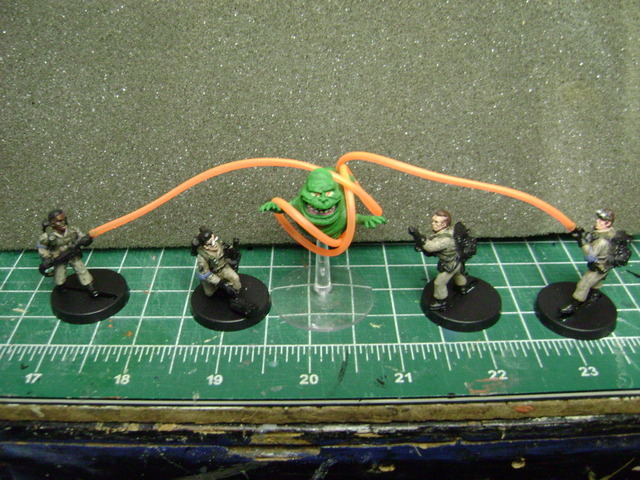 Thought she would make a good Female Ghostbuster, say like Janine, even though she's dressed a bit skimpy. Are they the same size? Here are two with Ray. I also started painting things. I get to spend about 10 minutes or so at a time, so progress is a bit slow. 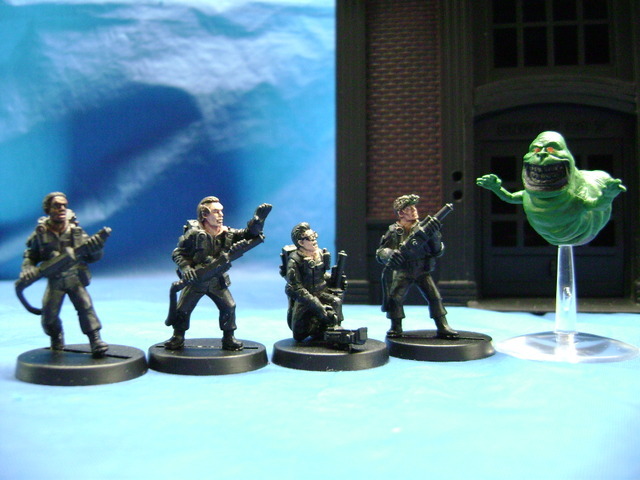 First up are the Busters! Still working on the faces. 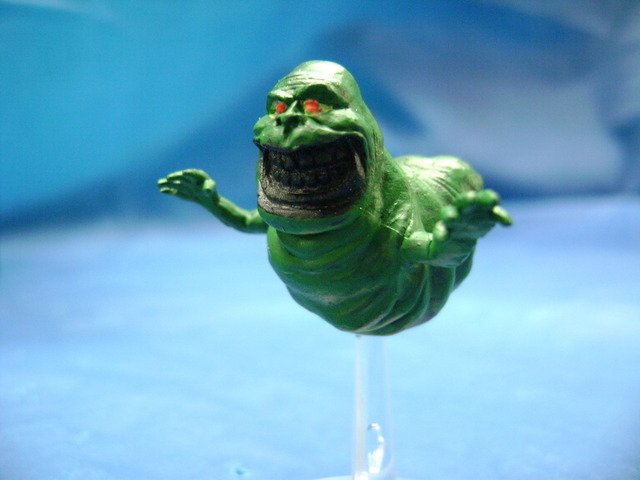 Next is Slimer! 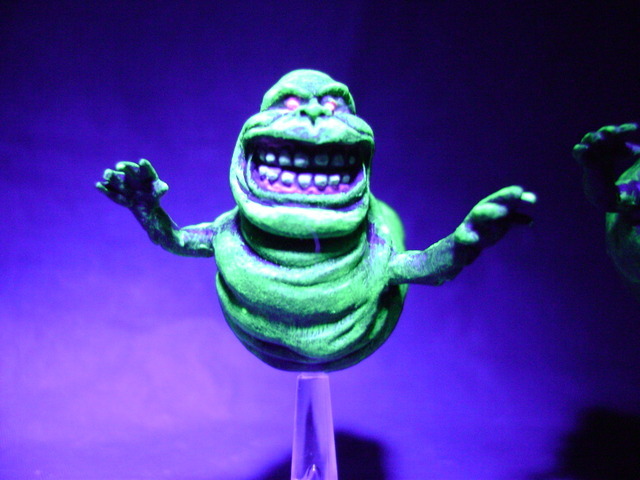 I purchased a clear base for him so he now "flies" and his eyes will glow under blacklight. 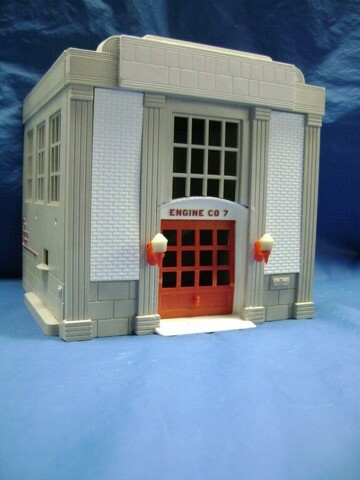 Firehouse! Paint it black...and then paint it some more. Last but not least, Janine! Still working on her right hand so she can hold a Trap. I did most of the paint up on her...first to see how the uniform colors would look and second...because I find that girls are more fun to paint than boys, but that's just me. You can't tell from this pic, but her Goggles Lenses will glow...so will Ray's. Looking at these close-ups, I see she needs a bit of touch-up painting around her boots and on her legs. Oh well, something for later this week. 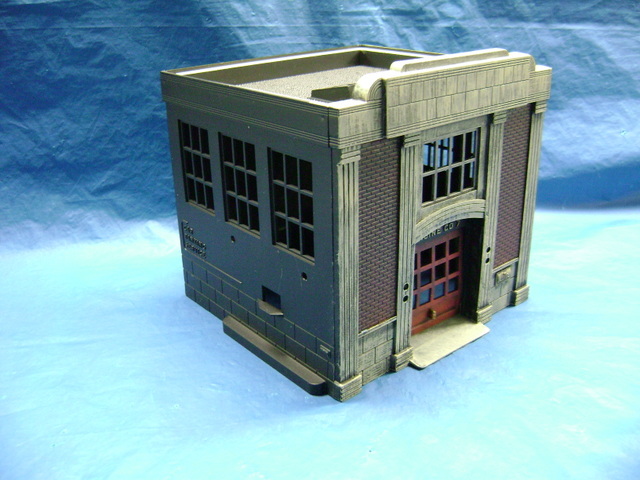 Twin Whistle Sign & Kit Co. is producing a pretty awesome looking train scale model of H&L 8. It's a little pricey for a fixer upper...but a nice find! 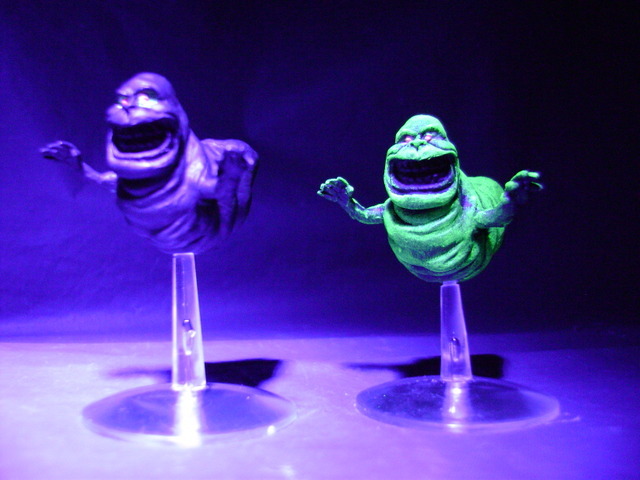 ...but hit it with some Black Light and Slimer on the Right starts to glow. Kill the regular lights and he's a standout. I'll finish up the Gums and Teeth so they glow as well. 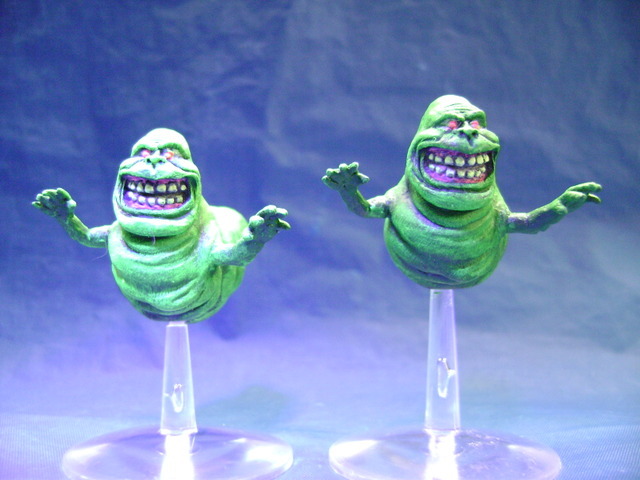 Clear base for Slimer can be purchased where? And did you glue him on or drill a hole in his tummy? Good, because they will soon be twins. 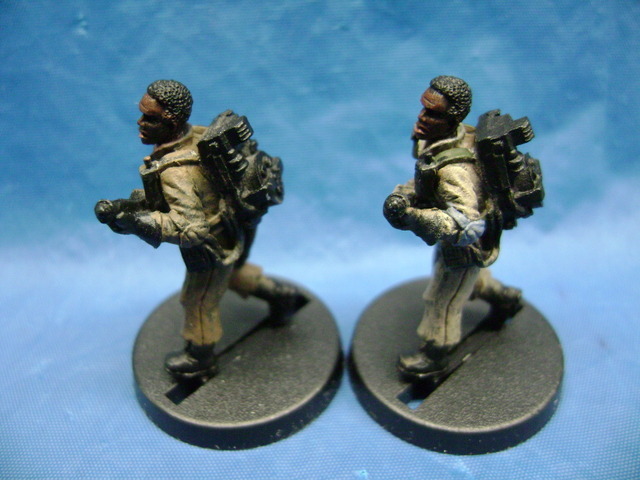 For those that haven't figured it out, I'm painting one set for myself and one for joeghostbuster. 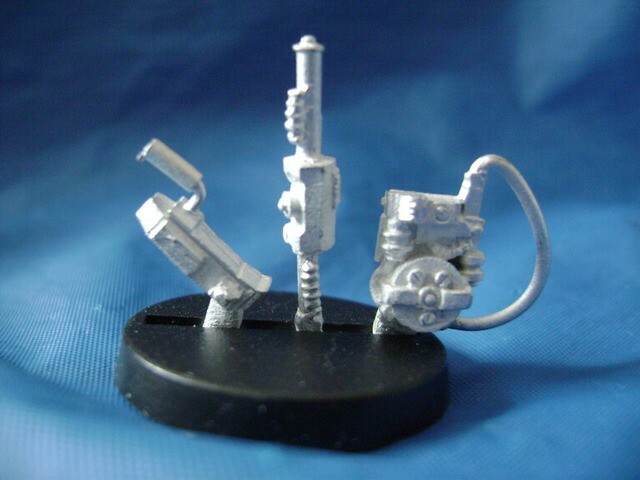 I got these from an ebay seller called Bits-World, but they should be found where Warhammer Game pieces are sold. I had to drill their tummies to set them on the stands. The fit is tight, but I will glue them in place once I'm done with their paint jobs. ...and just with Black Light. dude, you are freaking amazing. seriously, you hit this out of the park. and Im not just saying that because you're painting my set, I would be blown away regardless. 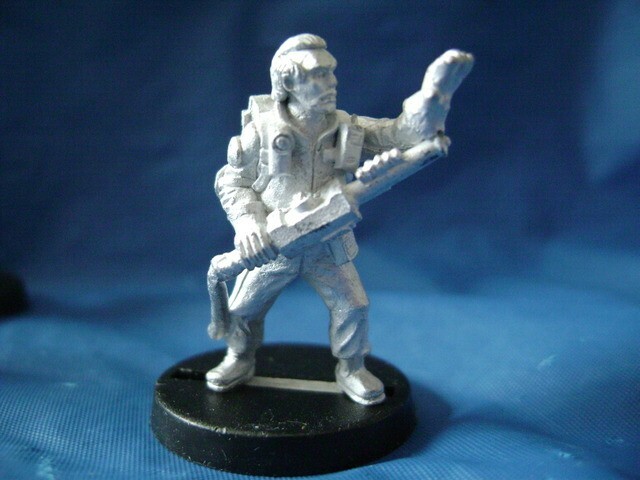 cant wait to see what you do with the busters. 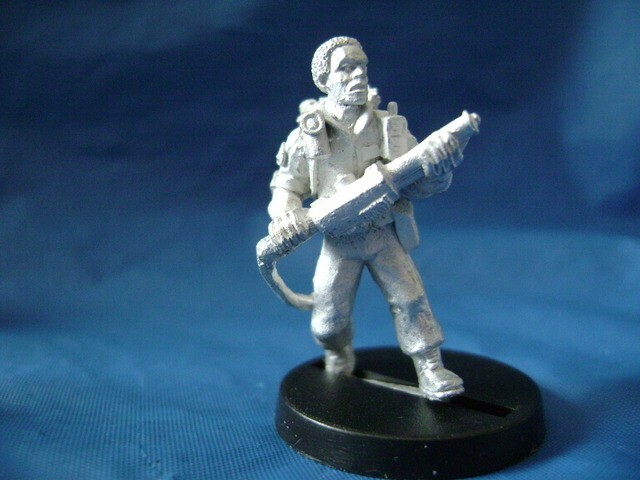 ... cant wait to see what you do with the busters. Well then, here we go. 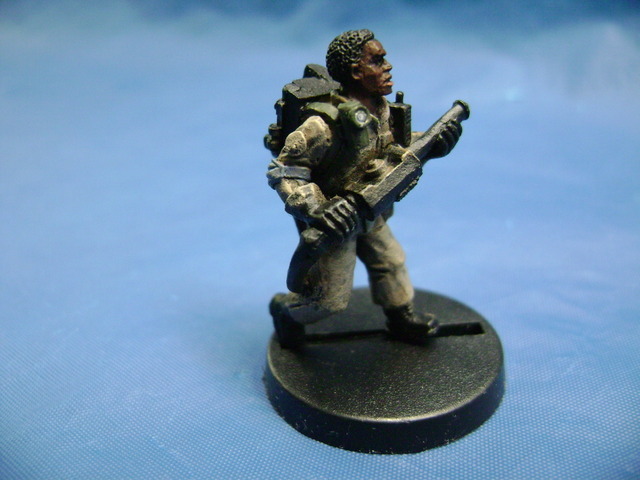 After giving all the Buster's uniforms a coat of "Graveyard Earth", I started working on one Winston to see how my chosen colors will look. 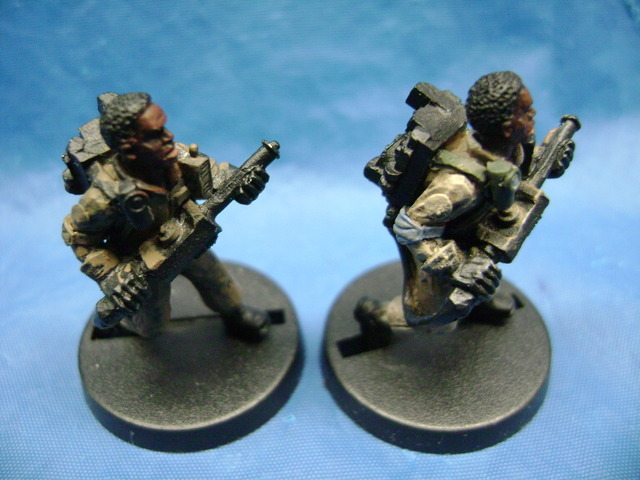 First I highlighted the uniform with Kommando Khaki. Pads were done with a base of Shadow Grey with Codex Grey highlights, his belt with Bleached Bone and the straps with Catachan Green . Looks like I'm off to a good start. Still need to do the boots, gloves, name tag and patch on his uniform. 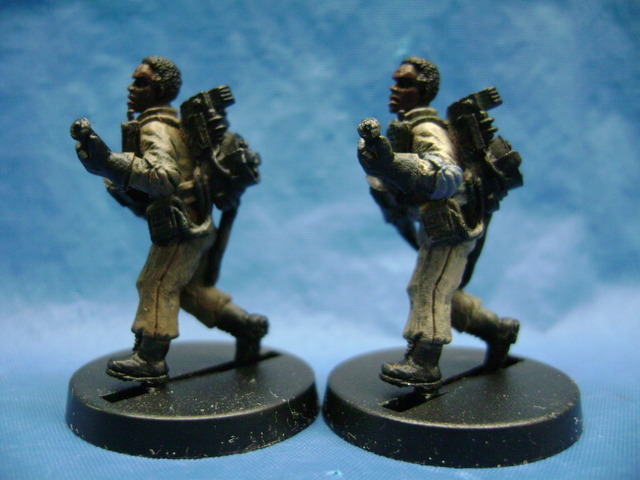 you'd never know these were a putrid pewter color before you gave them the magic touch! Last pics for this weekend. 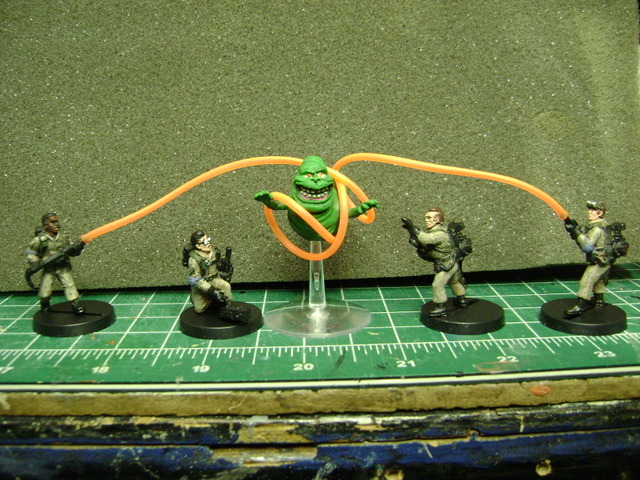 Joeghostbuster found this on Deviantart, click below to see the original display. It's well worth a look. That's awesome. You're right, the photo is definitely worth checking out. What's the tubing you used? It's real purpose is for making Necklaces with Pony-Beads. 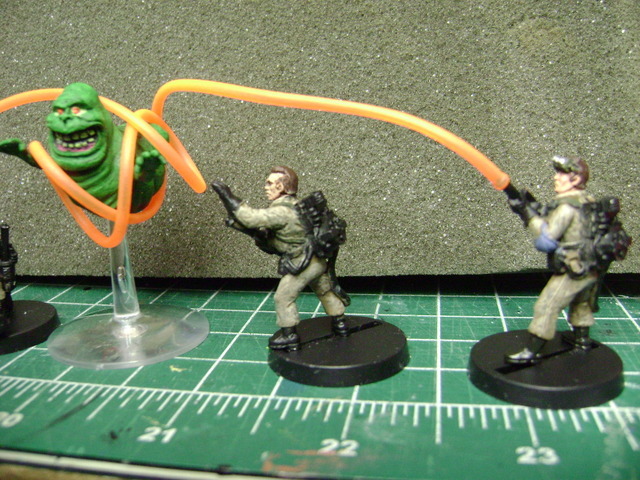 I found it a while back in an A.C.Moore Craft Store when I was hunting down "Slime Tubing" for the Rookie Project. 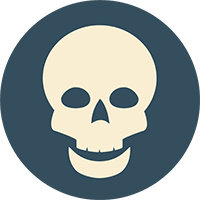 They make both Solid and Semi-Transparent colors like this one. The tubing in my pictures is "as is". 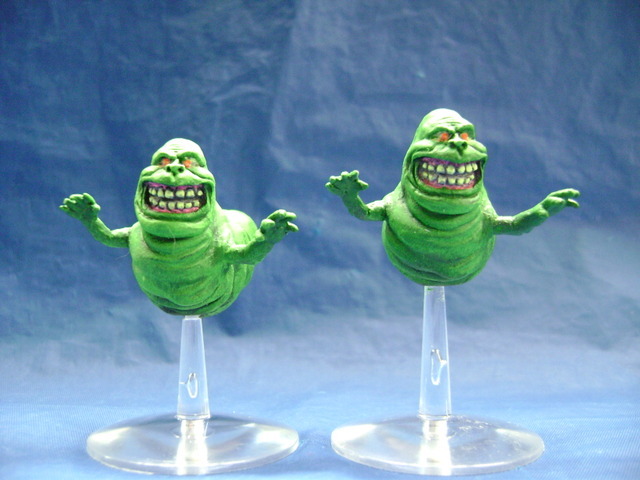 If I shove a thin wire through it, I should be able to make it hold shape and bend tight around Slimer's Arms, like the original Artist did. 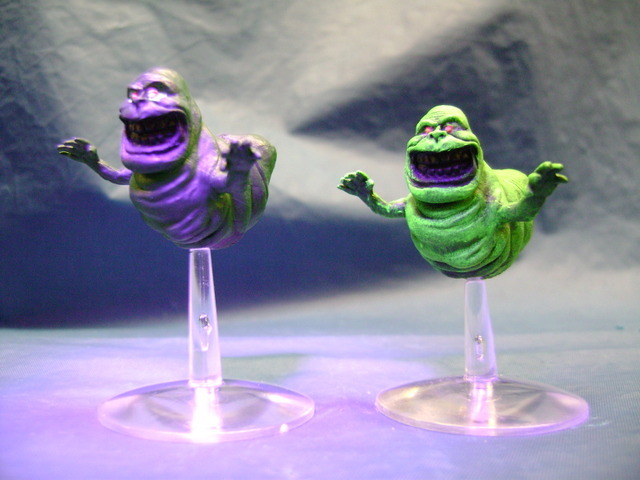 That being said, with a little bit of fudging, it should also work for the Kenner and Matty Figures as well. 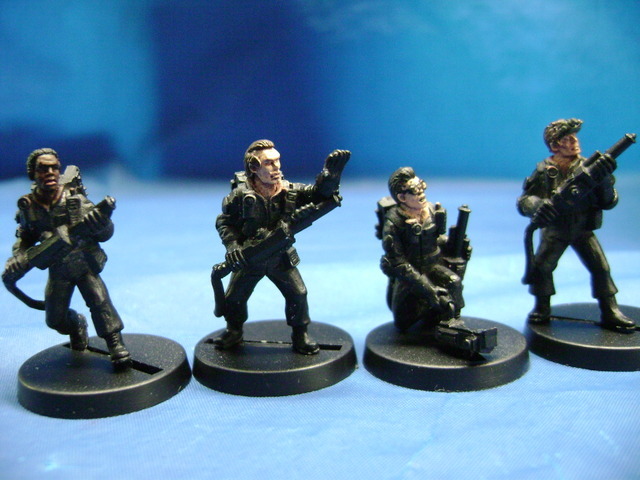 How are your Faux- Busters coming along? Post up some pics here, I could use the company. Thanks for the info on the tubes. 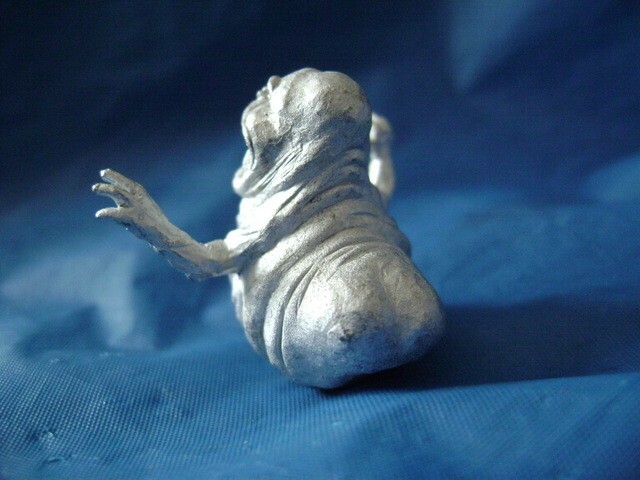 I haven't begun painting yet. I'm still awaiting a couple more things in the mail. I did go ahead and buy some acrylic paint, including some glow colors. I'm a little nervous... although I did paint a TON of Star Wars RPG minis with intricate detail and really enjoyed it, that was half my life ago. Before my eyes worsened to the point of wearing these bifocals. That's been part of the appeal of working on life-size props, actually. Not as hard to see! Still, I'm game to get back into it, see what I can do. Don't you have a pair of those magnifier lenses Dana wore at the museum? That could work no? I need to order some of these, they look fantastic! 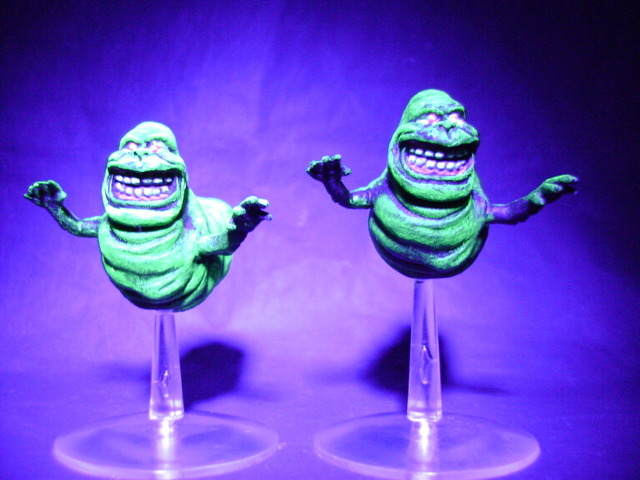 When I went to order a while ago, slimer was sold out.